Westharbor Homes named Silver award winner for the Kingston floor plan in the Single Family Production - 2,000 sf or below category. Westharbor Homes has been named a winner in the 2016 Professional Builder Design Awards contest, which recognizes the nation’s top home building projects for their design excellence, sales and marketing success, and construction quality. Sponsored by Professional Builder magazine, the PB Design Awards honor projects across 11 categories: single-family homes, multifamily homes, one-of-a-kind custom homes, “on the boards” projects, communities, systems built/modular, green, best revised plan, and urban infill. Westharbor Homes won a Silver award for the Kingston floor plan in the Single Family Production – 2,000 sf or below category. The winners were selected by a panel of esteemed residential design experts that included Larry W. Garnett, FAIBD, of Larry Garnett Designs, Glen Rose, Texas; Mark Larson, AIA, of Rehkamp Larson, Minneapolis, Minn.; Seth Hart of DTJ Design, Boulder, Colo.; and Tony Crasi of The Crasi Company, Cuyahoga Falls, Ohio. “Westharbor Homes is greatly humbled and honored to be receiving this award. We would like to offer our sincerest gratitude to Professional Builder for this honor.” – Cliff O’Brien, Director of Construction, Westharbor Homes. The PB Design Award winners will be featured in the September 2016 issue of Professional Builder, as well as online at Probuilder.com. The Kingston floor plan is one of five floor plans available in the Ludlow Cove Cottages neighborhood in Port Ludlow, Washington. Located on the eastern side of the Olympic Peninsula, this neighborhood of 42 cottage style homes can be situated on either a woodland, waterfront, or park-front home site. Both single-level and two-story designs are available with open concept floor plans, charming front porches, and master suites on the main level. 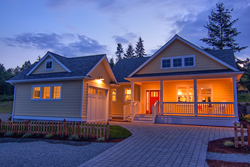 Westharbor Homes has been building homes for over 20 years on the Olympic and Kitsap Peninsulas. Our team specializes in new neighborhood construction and custom homes and is committed to exceptional craftsmanship and customer service. Westharbor Homes will professionally manage your custom home construction project from the point of land selection and acquisition all the way to move-in. Since 1936, Professional Builder has remained dedicated to serving the needs of the nation’s home-building community — builders, architects, designers, trade partners, and suppliers — with award-winning content and proven, practical solutions. The magazine is published by SGC Horizon, a division of Scranton Gillette Communications, and serves an audience of more than 121,000 leading decision-makers in the home-building market. For more, visit Probuilder.com.